Take a Deep Breath – At the discovery of a serious dental problem, your first inclination may be to panic or worry. To overcome the initial shock, take a deep breath to calm yourself, slow down your heart rate and think. Taking this approach will allow your brain to recall what steps you need to take moving forward. Contact Your Dentist – Once you’ve calmed down some and you’re thinking clearly, the next step should be to reach out to your local dentist. You’ll be able to speak with a trained staff member who can direct you as to what you should do for relief and to get you scheduled for an emergency visit. Knocked-out tooth – If you lose a tooth, then the first thing you should do is clean your hands, grab it by the crown and carefully place it in its rightful place. Another option is to let the tooth soak in a cup of milk. Keep in mind that it’s imperative that you see your dentist soon because you have a two to six-hour window to have the tooth reinserted. Broken or fractured tooth – A broken or fractured tooth can happen in an instant from eating certain items to even being involved in a collision, and you may notice some discomfort initially. Until you can be seen by your dentist, be sure not to chew on that side of your mouth. Temporary Crown Falls Out – When you’re waiting on a permanent crown restoration to be crafted, your dentist will fit you with a temporary crown to wear. If it falls out, your tooth is left vulnerable to food particles and decay that can cause a host of greater problems. While you wait to be seen by your dentist, you can use toothpaste or dental adhesive to temporarily re-attach the fixture. 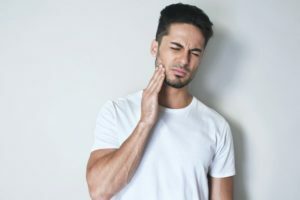 Toothache – A toothache is usually the product of prolonged dental neglect, where decay has been allowed to grow and destroy more of your tooth while penetrating the gums. You can try gargling with a salt-water solution, carefully flossing around the infected tooth, and for some pain relief, you can take up to 600 mg of ibuprofen. Dental emergencies are no fun, but you can recover much faster when you’re prepared. So keep these tips in mind and reach out to your local dentist with any other questions you may have. Dr. Sarah Esparza earned her DDS degree from the University of Maryland Dental School, and has since gone on to provide the greater Virginia Beach area with quality care for nearly two decades. To stay abreast of the latest changes in the world of dentistry, she maintains membership with several professional organizations. Dr. Esparza can be reached for more information through her website.